CNC machined aluminum compressor inlet flange for GT25/28/28RS compressor housings with 2 bolt inlet flange. Fits any Garrett GT28, GTX28, GTX29, GT30, or GTX30 series turbocharger with alternate compact 2 bolt inlet GT28R style compressor housing. 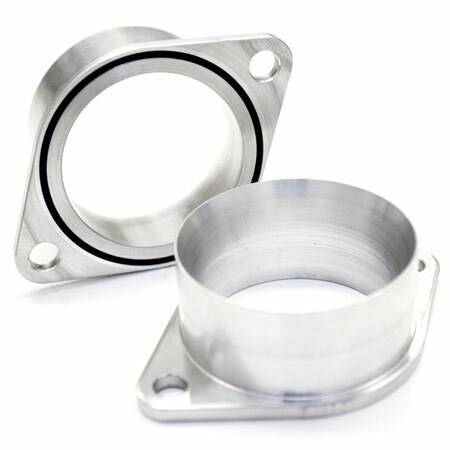 Converts the 2 bolt flange to a large bore and 2.5" outer diameter inlet for slip on connection. Alternate options include a 2" or 1.75" diameter adapter. * Fits any Garrett GT28, GTX28, GTX29, GT30, or GTX30 series turbocharger with alternate compact 2 bolt inlet GT28R style compressor housing.